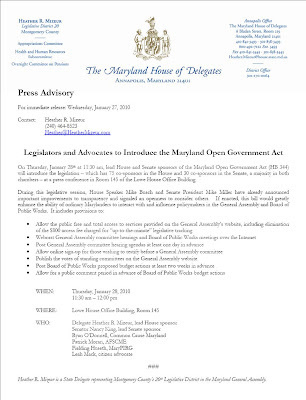 Delegate Heather Mizeur (D-20) has amassed 75 House co-sponsors and 30 Senate co-sponsors, a majority in each chamber, for her sweeping Maryland Open Government Act. The bill, which is lead-sponsored by Nancy King (D-39) in the Senate, would enable free public access to the General Assembly's "up-to-the-minute" bill tracking service, which is currently available only for an $800 fee; post General Assembly committee agendas a day in advance; webcast committee hearings; and substantially open up the proceedings of the Board of Public Works, which currently has the power to implement gigantic budget cuts without public input. Mizeur deserves credit for crafting a comprehensive bill and attracting widespread and bi-partisan support for it. We reprint her press release below. What does Massachusetts Mean for Maryland? Lenett to 19: Who's Your Daddy? Duchy to Rivals: Who's Your Mommy? Hunk of the Hill = King of the Hill? Ficker Applies for Planning Board... Again! Pugh on Dr. Martin Luther King, Jr.
Haitian Orphans Need Your Help! Ficker to Ali: "You are the Greatest"